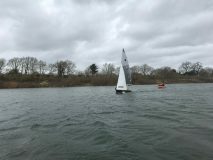 On Saturday 16th March, despite a rather foreboding weather forecast putting off quite a number of participants, 10 hardy and keen sailors turned up to dark skies and 30 knots at Papercourt for a southern area training session with GP ace Ian Dobson. 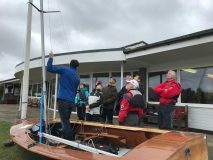 The morning session was held in the classroom and around the boat to talk about technique, study videos and talk tuning. 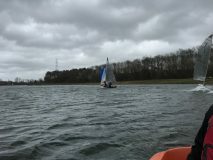 In the afternoon 2 GPs accompanied by 2 powerboats ventured out on the water with sailors swapping in and out for 1 on 1 sessions with Ian or opting for the relative comfort of watching from the powerboat. 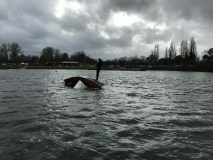 Despite the high wind, there were relatively few capsizes, with people having learnt from Ian about high wind tacking and gybing in particular.